From the open sky and the depths of the ocean to the racetrack of Formula One, Bell & Ross has a stellar offering for each of these thrilling universes. The watch takes its design cues not from the cockpit instrument as per the norm but a US Air Force bomber jacket from 1958, the MA-1. Its olive green nylon and orange lining are translated into a dark khaki ceramic case and orange numerals and indices on the sandwich dial. Complementing them is a reversible leather strap in khaki and orange. An automatic watch with date, it is limited to 999 pieces. Bell & Ross propels its partnership with Renault Sport F1 Team forward with the incorporation of a flying tourbillon into a chronograph timepiece. The grand complication, which appears at ‘6’ on the openworked dial, makes it the crème de la crème of the R.S.19 collection. In addition, there is a new lap-by-lap time marker around the bezel complemented with a stopwatch function. Limited to 20 pieces, the Renault Sport F1 yellow adorns the flange and the top of the crown. The French-Swiss watch company follows up last year’s incredibly cool bronze diver with a sleek all-black version. It’s certified ISO 6425 for meeting the technical standards of a true diving watch including water resistance up to 300m, a unidirectional rotating bezel with graduated minute scale and legibility in the dark. The Diver Black Matte features a high tech ceramic case that is scratchproof and adapts to body temperature for better comfort. 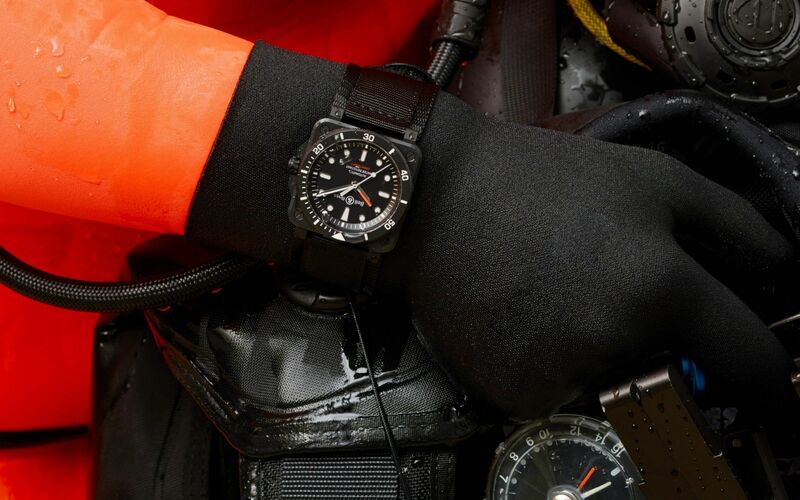 Important indications during a dive such as the indices, minute scale and minute hand are coated in Superluminova.